Session 302. A gusty northerly is always challenging at Brighton. I headed out on Lithium 9 depowered and the North Nugget. There were quite a few other kiters out and lots of blue blubber jellyfish in the water further out. I got yanked off my board a few times and found doing a water start tricky at times, but most of the time I made my jybes. I could ride the bay swell in for a while when further out past the other kiters. I was wary of ending up in the water among the jellyfish though. I think I will fit the footstraps to the Nugget as I think it will become my board of choice for downwinders. Look at all the jellyfish! Session 302. We detoured to Sandy Point on the way home from Paynesville as the wind forecast there was good. Grant and Stu did some flatwater speed runs on the windsurfers on the inlet, the rest of us headed to the surf beach for an epic session. I headed out on my Lithium 9 and S-quad. Getting out through the surf is easier than at Inverloch as the long shallow beach means there is no savage shore break or dumping waves. The water was a lovely azure blue colour out the back. I caught some great waves coming in, really getting to surf them well. This is where kitesurfing excels - you get a tow out, then a tow back in to the waves. There was enough power in the wind to get a good boost over bigger breaking waves going out. 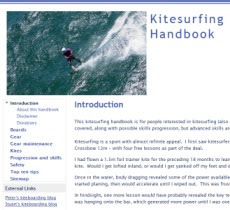 I depowered the kite coming in to maximise time on waves. Even then, I got dragged off a few. Everyone had a go and a great time. I came in for a drink and brief rest before going out for a second go. I noticed mistakes increasing as fatigue set in so I came in, very happy to have such a great session in the surf. A great way to cap off our kitesurfing safari! Session 301. We did some speed runs across Lake Victoria, chasing each other and the windsurfers, and some jumps. Jumping the Sector 60 is a hoot. Load up the kite, yank it clear of the water then float it down. I was still on my Lithium 12 so I had plenty of power. Tarren just missed the shore as the wind dropped and his kite went down off the point, so Grant, Stuart and I headed out in the boat to rescue him. Stu, Grant and I had a nice counter tea in the Paynesville pub. I can recommend the cold/warm mixed seafood basket. Kitesurfing Rescue Point self rescue!